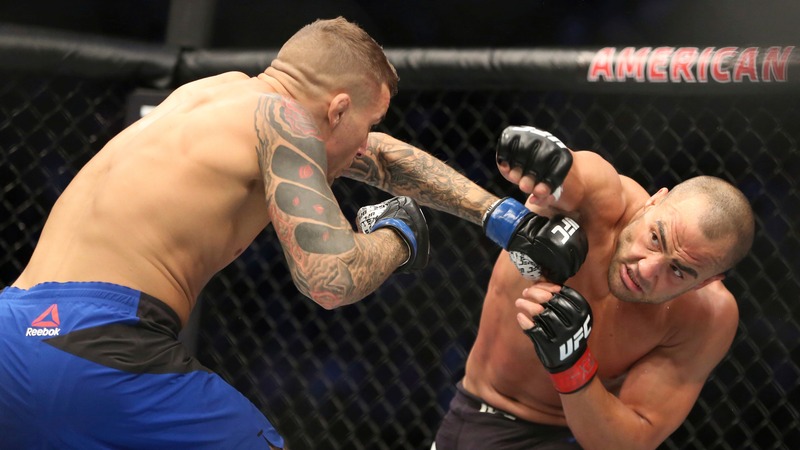 UFC Calgary takes place Saturday night and features a rematch between Dustin Poirier and Eddie Alvarez. Poirier has lost just twice in the UFC but is he worth his $8,800 salary on DraftKings this week? UFC Calgary takes place Saturday night and features a rematch between Dustin Poirier and Eddie Alvarez. Poirier has lost just twice in the UFC but is he worth his $8,800 salary on DraftKings this week? Here are top DFS plays for UFC on Fox 30: *Salaries are based on DraftKings pricing. * ## Dustin Poirier ($8,800) Poirier faces Eddie Alvarez in a rematch from a fight in 2017 that was declared a no contest after Alvarez delivered two illegal knees. Before the foul, Poirier had rocked Alvarez and out-landed him in significant strikes 73-44. Since then, Poirier has defeated Anthony Pettis and Justin Gaethje both by TKO. Alvarez is a tough fighter but he’s been through a lot of wars and at this point in his career, Poirier is on another level. Poirier has lost just twice in the UFC since 2014 to Conor McGregor and Michael Johnson. Alvarez defeated Gaethje in his last fight after getting destroyed by McGregor and the NC with Poirier. This fight is going to come down to striking and the advantage goes to Poirier who averages 5.57 significant strikes per minute. Alvarez is hard to finish but he absorbs a lot of punishment (4.28 strikes per minute), which is good for DFS purposes. I expect Poirier to finish Alvarez at some point but even if the fight goes the distance, he’ll rack up over 100 significant strikes and be worth his $8,800 salary on DraftKings. ## Jeremy Stephens ($8,000) This is a case of two fighters going in opposite directions. Stephens has won three fights in a row, while Jose Aldo has lost three of four. There’s no denying that Aldo is the more physically gifted fighter. He was considered one of the two or three top pound-for-pound fighters on the planet a few years ago. However, Aldo has been mentally shot since getting embarrassed by McGregor. He’s been knocked out in three of his last four appearances in the Octagon. Stephens isn’t the opponent a fighter wants to see when his confidence is shaken. He comes straight forward with a lot of pressure and Stephens has a granite chin, making him difficult to finish. Stephens has only been knocked out once in 42 career fights. One of the hardest hitters in the featherweight division, Stephens has won just under 70 percent of his fights by knockout and Aldo is much easier to hit now than he was back in his prime. Aldo has the physical tools and power to stop any opponent but he hasn’t been the same fighter over the last four years. I expect Stephens’ style to bother Aldo and deliver him another KO win. ## Alexander Hernandez ($7,900) Hernandez and Olivier Aubin-Mercier should provide one of the most entertaining fights of the night, so I’m going with the slight underdog here. Hernandez won his UFC debut in impressive fashion with a 42 second demolition of Beneil Dariush. He’s won seven fights in a row with five coming by stoppage. The only blemish on Hernandez’s record came back in 2013 in a controversial split decision loss to Jacob Montalvo. Aubin-Mercier has been just as impressive winning his last four UFC fights. A strong grappler, 75 percent of Aubin-Mercier’s wins have come by submission. He isn’t much of a striker though, landing just 2.78 significant strikes per minute. This fight really comes down to if Hernandez can stay on his feet and turn it into a brawl. Hernandez is a much more dangerous striker and if he can keep the fight standing, I like his chances to pull out the win. ## Tecia Torres ($7,000) It was once unthought of to pick against Joanna Jedrzejczyk but times have changed since she’s dropped consecutive fights to Rose Namajunas. While Namajunas is still the only female to defeat Jedrzejczyk, Torres is in a good spot to pull an upset here. Jedrzejczyk has gone five rounds in five of her last six fights. Since 2015, she’s fought 31 rounds in the Octagon. That can take a toll on any fighter and the proof is she’s starting to slow down and get hit more. In her last fight, Namajunas connected on 105 significant strikes. It’s only the second time in her career that Jedrzejczyk has absorbed more than 100 significant strikes in a fight. Torres has always been on the cusp of joining the elite women in the strawweight division and this could be her time after winning three of her last four fights. Jedrzejczyk still lands a ridiculous 6.63 significant strikes per minute but if Torres can withstand her early barrage, she has a good chance of pulling the upset at just $7,000 on DraftKings.